Bic Cristal easy glide blue is a great pen to write with,they are budget friendly so if lose them not a problem and they last! I don’t know of a single house that does not have these. They always work and never leak. They are a bit of a staple in this house with the kids writing me constant lists. These pens are fantastic to write with. They are comfortable to hold and feel smooth as you write on paper. They seem to last for ever and I have not had any issues with them drying out if the lid isnt replaced. However i do not recommend you put them in the wash! 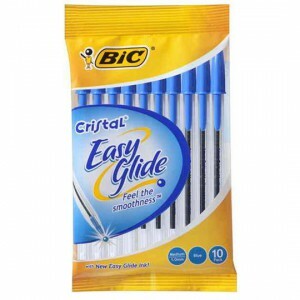 How would you rate Bic Cristal Easy Glide Pen Blue?